Zombies may be experiencing a sort of modern day renaissance, but the truth is that when zombies are around, the living have everything to lose. Thankfully, with even more zombies roaming around than ever before, zombie hunters are also on the rise and are ready to take action! Zombies need to be on guard because the Child Zombie Hunter is patrolling the streets and he's ruthless, ready to make the zombie kill of the week! He's made it a long way in the Zombie apocalypse and we'll let you in on a little secret—he didn't do it by making friends. Let your child suit up as a true survivor with this costume! 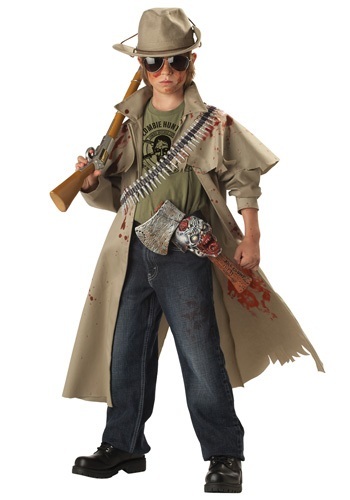 This zombie hunter costume is a unique kids costume that comes with everything your child needs to take on the undead – one corpse at a time! The olive green shirt has ‘zombie hunter’ along with a zombie head and two crossed guns printed on the front. The knee-length trench coat has a tattered hem and sleeves. The signature hat is made of a khaki polyfoam and has an elastic cord. Now for the fun stuff – this costume comes with a plastic axed with fake blood and a ‘kill count’ carved into the handle. The axe sheath is shaped like a zombie head and is attached to a plastic belt. For a finishing touch, the plastic bullet belt fastens with Velcro and can be worn around the waist or shoulder. Don’t forget to add the toy rifle – he can’t hunt zombies without it!